I have just discovered this video! It’s been awhile since I watched a TEDTalk and wrote it here on my blog. After watching this talk delivered by Sherry Turkle, I decided to quickly write it here. I have complained a lot in this blog about the Internet, gadgets, and social networking sites which have done a great deal in changing the way we, the humans, interact with each other. To be honest, they are not entirely bad. Thanks to social networks, I can be connected again to my long lost friends in elementary school or high school. I remember about a half a decade ago, I used to be the one who searched for them on the Internet and made a mailing list group so that we could keep in touch. When only few people used Friendster, I told everyone to create an account there. When Facebook gained popularity in the US (but not in other countries), I told all of my close friends to move to Facebook :P. I was busy making sure that although they’re not physically close to me anymore, I could at least reach them online. But now, every single person can be easily reached. Virtually reached, that is. Everyone is on Facebook, Twitter, YM, LinkedIn, GMail, aaah…. you name it! People, including me, are addicted to it. Every time we encounter something, we update our status. We no longer call our closest friends to tell them about it, but updating a status seems to be the coolest way to go about it. Hi-by friends or even strangers suddenly become our best “virtual listeners”. Friends or families are busy with their smartphones while having dinner together. It is absurd, if you really think about it (I’m criticizing myself too, you know!). We spend less time to have a real and deep conversation with people because we spend too much time online with people who we think they care (but they are not, really). This is the major difference between real conversation and “virtual conversation” (texting, email, etc). Real conversation cannot be perfected with technology. There is no rewind or undo button. We can appear as perfect as we can virtually. We can appear as the person we always want to be virtually. We can pretend to care when we have a hard time to show our care to other people in the real world. We get to do things that we cannot do in real life. What’s more is that, technology seems to be the thing we turn to when we are most vulnerable. As Sherry puts it: “The feeling that ‘no one is listening to me’ make us want to spend time with machines that seem to care about us.” Technology makes us feel connected, somehow. The moment that we are alone, have nothing to do, waiting for the bus, or have nothing to talk about with the person next to us, we immediately try to reach our small device. For me, social networks are important to keep in touch with friends that are thousand miles apart from me. But to those who are within few km distances, I’d rather have a meaningful one-to-one conversation over coffee, lunch, or dinner. That’s the only way to understand and learn about my friends. No amounts of emails, Skype, and YM messages can beat real conversation. It is hard to loosen up my addiction to social networking, but at least I know that I still prefer the old traditional way of interacting. With the loneliness plaguing my life, talking to friends online in any way cannot heal this feeling. In order for it to disappear, I need friends who are physically here, talking to me. While some chats and emails did help in motivating and encouraging me, all of them are temporary. They are like medicines that can heal the pain but unfortunately, they cannot cure the actual disease. I’m not suggesting to ban social networks and abandon them all together. But what I’m suggesting is to spend more meaningful time with the people around us. Talk to them. Know them well. Socialize. At least, put our smartphones away when we are with them. I do get annoyed by it when everyone is with their phones!!! 🙂 So, let’s do myself and everyone a favor that when you sit down with your friends, put your mobile phones away. Prove yourself that you can ignore this device, even though it’s merely an hour long. I’m on the front page! YEAAAAH! 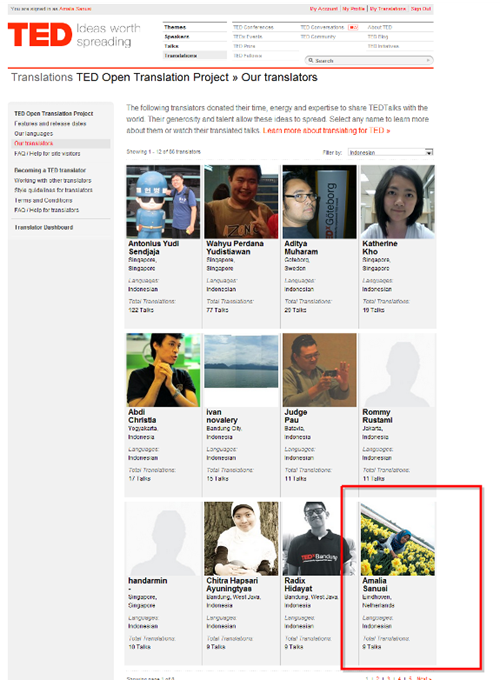 I’m on the first page of Indonesian translators on TED! How cool! Hahaha… I would be "kicked out" by someone else if I stopped translating :P.
At least I know how it feels to be on the first page (does it matter?!) hahaha. I’m going to translate more videos if I have free time! TED is the coolest thing ever. Here are some of the talks that I’ve translated. This is an excellent talk by Dr. BrenÃ© Brown. And yes, she’s a research professor who has spent the past ten years studying vulnerability, courage, authenticity, and shame. So this talk is actually based on her decade of research into this topic! I’m not going to write all the things she said, because you really need to watch it (she’s a great storyteller!). But there’s one thing that kinda struck me, which is of course vulnerability. I hate to be vulnerable. I really hate that because I feel so weak. And I don’t like to be weak. When friends asked me if I were okay, I would say yes, although I felt like crying inside. When I felt betrayed, I barely wanted to admit it. When somebody didn’t treat me right, I acted as if I didn’t care, but I actually did. The point is, I never wanted to admit that I was affected, hurt, or broken-hearted, especially to the person who caused me so. And I never wanted to let myself loving someone so deeply because of fear of separation. This is all related to weakness (and being looked as a weak human being), fear of something, and my image (of being strong and the urge to keep that image with me). Then I questioned myself, WHY IN THE WORLD DID I DO THAT?! Clearly, I’ve been unconscious! And I was awaken by Brene, this video. She taught me that it’s okay to be vulnerable. She said, "Vulnerability is at the core of fear, anxiety, shame, and very difficult emotions that we all experience. But vulnerability is also the birth place of joy, love, belonging, creativity, faith…." We tend to deal with our vulnerability by "numbing" vulnerability. Evidence includes debts, over weight, addiction to alcohol or drugs or even busy-ness. But the problem is that, we can’t selectively numb emotions. If we numb "the bad things" like vulnerability, grief, shame, and disappointments, we automatically numb the other good things, like joy, gratitude, and happiness. That’s when we feel miserable, looking for the purpose and meaning of life, etc. And that’s bad, isn’t it? So how do we do it? How do we live wholeheartedly? We have to fully embrace vulnerability, not deny it. We’re not only have to embrace our vulnerability, but also need to embrace the vulnerability of others. It’s our vulnerability that makes us beautiful. The willingness to love others first with our whole hearts. The willingness to do something where there are no guarantees. The willingness to invest in a relationship that may or may not work out (ouch!). I’m going to start to embrace my vulnerability for now. Somehow I found it much easier to embrace other’s vulnerabilities than my own. Bismillah. Let me be free. Yippy. I’m officially a TED translator. I’m still waiting for my request to translate this video to be approved, hopefully within this week! As I’m a big fan of TED, I decided to spend some hours of my time to translate some of the videos into Indonesian. The good thing about being a TED Translator is that you’re not bind into some contract or anything like that. You have the choice to translate whatever video you like and you’re given 30 days to complete it (after which, other TED Translators may take over). So it’s very flexible! You probably think poor people all across the United States can just pick themselves up out of the dirt, go to college, and get a great job, thus eliminating all of their problems. And if they don’t do that, they’re lazy. It’s so frustrating dealing with people who do not understand how external factors contribute to the perpetuation of poverty in the United States. Take a look at "In Search of Respect" by Philippe Bourgois, and he’ll show you how the downtrodden turned their lives around, ditched the drugs, and said to society "I"m ready to change my life." They try to get a job. Society replies, "sorry, you don’t fit in with us well-to-do people. You don’t dress right, you don’t have the skills, and you don’t have the attitude to be a successful person." Yet, from the beginning, society inhibited their ability to, for example, get the decent "education" required to function in society. It’s a vicious cycle, and it applies here. It doesn’t only exist in the U.S. It’s everywhere. What can we do about it? I just finished watching a very interesting TED presentation by William Li about a new way to treat cancer and other diseases. He introduced a new term which I hadn’t heard about: angiogenesis, which is the process involved in the development of new blood vessels. As we all know, blood vessels are one of the most essential parts of circulatory system that transport blood throughout the body. There’re about 19 billion of these blood vessels exist in our body. The amount of blood vessels that are present at any given time are controlled and regulated by our body. These vessels can either grow to form new blood vessels or can be pruned back to remove excess blood vessels to baseline using simulators and/or inhibitors of angiogenesis. However, everything does not always run smoothly. Defects in the system do exist; i.e. when the body can’t prune back extra blood vessels or can’t prune grow enough new ones in the right place at the right time. In these situations, angiogenesis is out of balance, which results in a myriad of diseases. For example, insufficient angiogenesis (not enough blood vessels) can lead to wounds that don’t heal, heart attacks, and nerve damage; while excessive angiogenesis (too many blood vessels) can lead to cancer, blindness, obesity, and Alzheimer’s disease. The interesting thing is that: there are more than 70 major diseases that actually share abnormal angiogenesis as their common denominator. And the new way to tackle these diseases is by controlling angiogenesis! Let’s take a closer look at cancer. Well, everyone of us has microscopic cancers in our body. These cancers are small, microscopic nests of cells that can only grow to one half a cubic millimeter in size (which is as small as the tip of a ballpoint pen). They can’t get any larger due to lack of blood supply (no oxygen & nutrients). So they’re not dangerous at all, until they get a blood supply. As Li said, “the body’s ability to balance angiogenesis, when it’s working properly, prevents blood vessels from feeding cancers.” That means, we can prevent cancers (and other diseases) by blocking angiogenesis and preventing blood vessels from reaching cancer cells, right?! In fact, there’s a so-called antiangiogenic therapy/drug which aims at cutting off the blood supply to cancers. It seems quite promising! I seriously have never heard of it before. It seemed to me that chemotherapy was the only way to fight treat cancers. 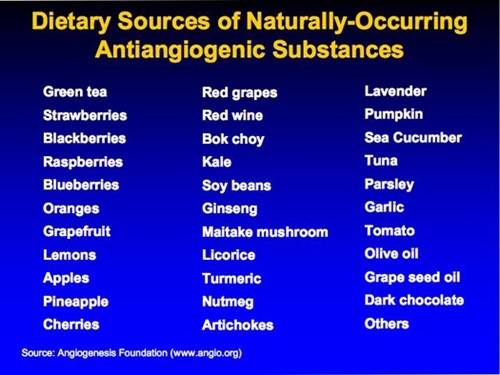 But of course, anti-angiogenesis drugs do have side-effects, some of them are quite serious. In fact, the risks of using these drugs might actually outweigh the benefits. I haven’t done quite an extensive research on this but I found that these drugs may result in tumor recurrence at many sites in the body. Scary, but I think more research needs to be done about this. Another interesting talk from TED, this time by Adora Svitak about what adults can learn from kids. The fact that kids are so naive and have much less experience than adults makes them dream with no limits and boundaries. As a kid, I used to do that. I used to dream about traveling abroad during the time when my dad had little money to even support us. But who would have thought that few years later, my dad took the whole family to travel around the Middle East. I also used to dream about studying in an English-spoken country when I knew that it was impossible to even talk about it! But who would have thought that I got the opportunity to set my foot in Australia in 2004? It’s amazing. Now.. moving on to my dream about setting up a school for lower class to middle class Indonesians in Jakarta. I’m no longer a kid, but I still have this dream. Whether or not I’ll be able to realize this dream is another story. But I just need some support from people around me, especially my own family. Mom supports me, of course, but she has this skepticism (as always) and she thinks that it’s very hard and I shouldn’t be too ambitious about it. Now, I don’t like this kind of attitude. Of course, I’m not expecting it to be easy: building a school with cheap tuition fees but high class teachers… who would think that it’s going to be easy? But positive attitude (including trust) and continuous support is all I need, and that makes me want to dream more, feel motivated, and try harder. I don’t think I mind if I don’t get to reach my dream, but as people say… the experience and the journey to reach such dream is what makes a difference.